Begusarai (Bihar), April 15: Lack of basic amenities and unfulfilled promises by the government has forced electorates of Bihar's Thatha village to boycott the ongoing general elections. Residents of the village told ANI that neither the district administration nor any politician has paid heed to their demands in the last five years. Surrounded by river Budhigandak on three sides, the village in Begusarai district has a single road which connects it to the rest of the state. However, none of the residents wish to travel by it as the condition of the road is dilapidated, thereby forcing them to travel by boat. Lok Sabha Elections 2019: Dharmendra Campaigns For Hema Malini in Mathura. Protesting the apathy, locals of the village have decided to stay away from voting. A Thatha resident Geeta Devi said: "There is no medical facility in the village, and to reach the nearby hospital, one must catch a boat before 8 pm. Similarly, pregnant women and students of the village suffer in the absence of a road. The entire village would boycott polls unless they are provided with a bridge or a road. "Pehle raasta, phir vote (First road, then vote)," she added. Echoing similar sentiments, a student whose school is situated across the river said, "The road is in bad condition that is why we use the boat. I often get late to school. There is no other way. The government is doing nothing to fix this". 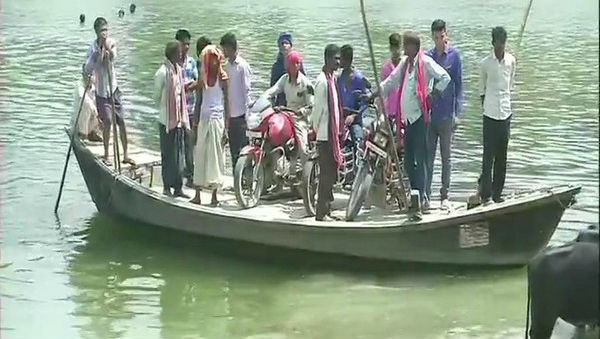 The entire episode also adds to the woes of the lone boatman of the village, as he claims to be travelling at least 200 times a day, back and forth.Bihar goes to polls in seven phases. The counting of votes will take place on May 23. Lok Sabha Elections 2019: Karnataka Bans Smart-Phones Inside Polling Booths.